Thermometer Takes A Roller Coaster Ride. Click On The Photo/Maps To Enlarge Them. 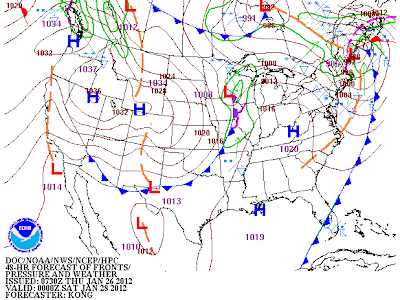 Surface Map Forecast Valid At 5 PM MST Fri Jan 27, 2012. Today will be a little warmer than yesterday across SE NM with our afternoon high temps expected to be in the low-mid 60's. Mostly sunny skies, and dry downslopping westerly winds will kick up tomorrow afternoon ahead of an approaching cold front, at around 15-20 mph with gusts near 30 mph. Our afternoon highs should climb up into the upper 60's to low 70's with a few spots seeing the mid 70's. Gusty northerly winds will accompany the frontal passage late tomorrow afternoon and early evening. 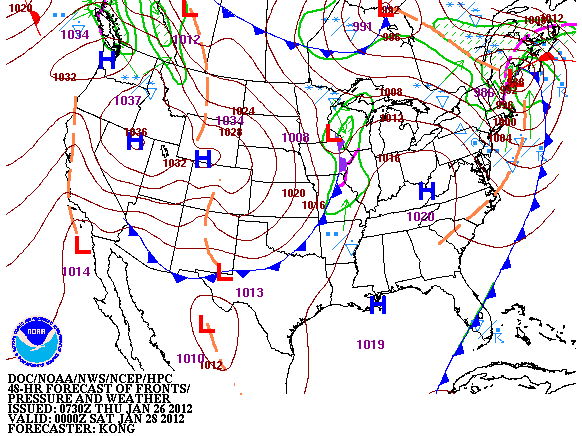 No significant weather is anticipated with this next cold frontal passage. Saturday will be a cooler behind the front with highs mostly in the 50's. Sunday's temps will rebound right back up to around the low 60's, and by next Monday we should see the low 70's again. So for the next several days our temperatures will take a roller coaster ride, but nothing too dramatic is forecast into the first of next week. Another Storm In About A Week? 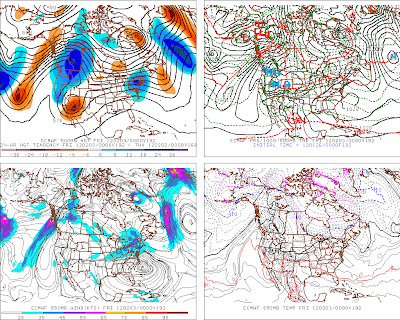 Last Nights 00Z/5 PM MST ECMWF Forecast. 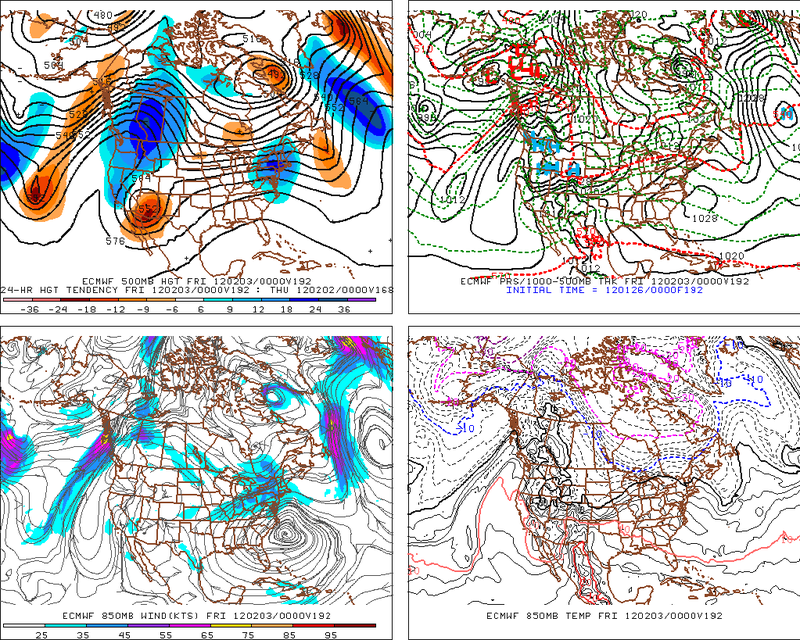 Valid At 5 PM MST Thu Feb 2, 2012. Next week looks to be fairly tranquil and uneventful weather-wise across SE NM. Our high temperatures are forecast to be above normal from Monday into Wednesday with readings in the 70's. Last nights 00Z/5 PM MST run of the European (ECMWF) computer forecast model indicates that yet another closed mid-upper level low will drop southward into the area late in the week. The GFS model did not depict this, but keeps the pattern rather progressive with a northwesterly flow aloft pattern over the area. Bitterly Cold Across Northern Alaska. Surface Temperature Map At 4 AM MST. 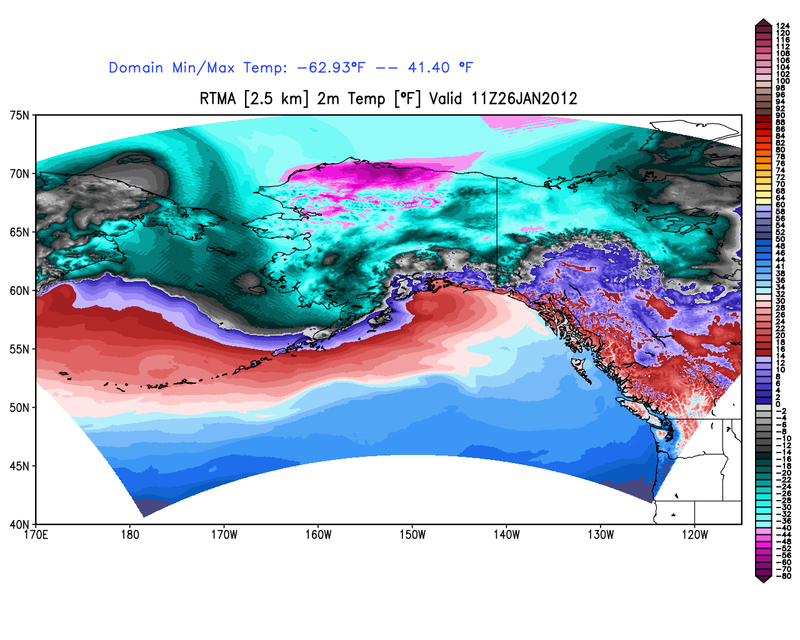 A bitterly cold polar airmass covers the North Slope area of northern Alaska early this morning. Temperatures in this region are as low as -64F with wind chill values down to -80F to -85F. Your roller-coaster temps are that. But here in Abq, the NWS calls it a roller-coaster...53, 55, 49, 53, 51, 55, 54. 5F change not even that much of a change, though I guess the airmass will be fresh and colder every few days. That bitter cold in Alaska keeps showing up...hoping it goes E and not into NM! This has been one of the most unusual winters that I have seen in quite some time David. Very untypical "La Nina" winter with the split in the jet stream, and such a strong and moist southern branch. The lack of winter over a great deal of the country is interesting to say the least. Id bet that our spring is going to be a roller coaster ride too.